We are constantly extending our dealer network to make Lakewood guitars available in your area. It can be pure magic spending time in a music store, exchanging ideas, contemplating the available guitar choices and deliberating back and forth. This is what leads to greater clarity about personal preferences, requirements and which model might fulfill them. Enjoy this time; it is rare and precious. We are committed to a close relationship with our dealers. Many of them have spent useful time in our workshop. 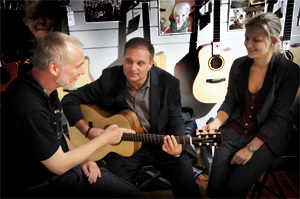 They are familiar with typical questions regarding our guitars and are able to provide competent advice and guidance. With a dealer listed on our website you will be in good hands! On these pages you can find dealers in your region who stock Lakewood guitars. The list is arranged by way of post codes.